Lateral ankle sprains are very common injuries that foot and ankle specialists frequently treat. 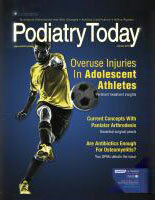 An estimated 2 million ankle sprains occur in the United States each year. Lateral ankle sprains are common among recreational and competitive athletes. The majority of lateral ankle injuries or sprains resolve with conservative therapy. Conservative therapy includes immobilization, rest, ice, anti-inflammatory medication and rehabilitation or physical therapy. However, up to 20 to 40 percent of injuries can lead to prolonged disability and/or recurrent injuries. Increased recovery time and recurrent injuries can be frustrating to patients who are eager to return to their physical activity level. When evaluating a patient with chronic lateral ankle instability, it is important to differentiate whether the patient is suffering from functional or mechanical ankle instability. The typical definition of functional instability is the patient having a feeling of the ankle “giving out” during activity or walking on uneven ground. Patients who present with functional instability typically do not have a true disruption of the ligamentous structure. For these patients, it is normal for anterior drawer and talar tilt stress testing to be negative. Mechanical instability, on the other hand, results from a true disruption of one or more of the lateral ankle ligaments. Patients presenting with mechanical instability will have a positive anterior drawer test with or without talar tilt. Whether the patient is suffering from functional or mechanical instability, it is also imperative to assess for any other associated pathology. Common associated injuries include peroneal injury, synovitis, arthrofibrosis and the presence of loose bodies or chondral lesions. If conservative treatment fails, there are several surgical options that have proven to be very successful with excellent postoperative outcomes. A modified Broström-Gould procedure has become the most routine procedure for primary lateral ankle ligament stabilization. The popularity of the procedure is due to its excellent and reproducible surgical outcomes. The procedure also uses native tissue to stabilize the ankle, which aids in maintaining anatomic foot and ankle mechanics. At the University Foot and Ankle Institute, our surgical technique involves a curvilinear incision along the distal aspect of the fibula. When there is concomitant peroneal tendon injury, one can extend the incision along the posterior aspect of the fibula, which facilitates examination and repair of peroneal tendons as necessary. Then identify the peroneal sheath and incise it to retract the peroneals inferiorly in order to gain access to the calcaneofibular ligament. Proceed to identify the extensor retinaculum and incise it in order to visualize the anterior talofibular ligament. Reflect the ligament off the distal tip of the fibula and take a small section as needed. At this time, insert two suture anchors into the fibula and repair the ligaments in a pants-over-vest fashion with FiberWire Suture (Arthrex). We then augment the repair by passing the sutures through an additional PushLock Anchor (Arthrex), which we secure proximally into the fibula. We have found this technique to be advantageous because it provides additional stability. Cho and coworkers compared the postoperative success of the modified Broström procedure using single versus two suture anchors. Their results showed that both techniques provided an effective repair. There was no significant difference in clinical or subjective outcomes. However, the study did reveal slightly more reduction in the talar tilt test postoperatively in the double anchor group. The modified Broström procedure has had excellent results when the native tissue is healthy enough to provide the necessary stability following the repair. The disadvantage of using this approach is the utilization of damaged ligamentous and capsular tissue, which may compromise the strength of the repair. Several techniques have emerged to help augment the anatomic repair with the use of autograft, allograft and synthetic materials. Autograft procedures include the use of peroneal, semitendinosus, plantaris and gracilis tendons. The benefit of using a peroneal graft is there is no secondary operative site morbidity. However, the potential complication is sacrificing strength of the tendon. We typically reserve tendon grafting for revisional surgery when primary stabilization procedure has failed. The preferred procedure would be to utilize an allograft to perform a more anatomic stabilization procedure. Mulhern and coworkers described an anatomic reconstruction of the anterior talofibular ligament and calcaneofibular ligament utilizing an acellular dermal matrix with interference screws. The authors advocate the use of biologic scaffolding to reinforce the attenuated ligament when there is insufficient soft tissue for a successful direct repair. They utilized the Graftjacket Maxstrip (Wright Medical Technology) to directly recreate the anterior talofibular and calcaneofibular ligaments. The described surgical technique includes placing one end of the allograft in the talar neck with a lateral to medial interference screw. Then one would pull the allograft through the fibular channel and place a second interference screw from posterior to anterior to recreate the anterior talofibular ligament. Pass the allograft from lateral to medial subcutaneously along the lateral aspect of the calcaneus. Then insert a third non-absorbable interference screw under appropriate physiological tension to recreate the calcaneofibular ligament. Utilizing an allograft in the technique described by authors maintains an anatomic repair. This preserves physiologic kinematics and motion at the ankle joint. Basra published a technique utilizing the InternalBrace system (Arthrex). The system includes #2 FiberTape (Arthrex), which is an ultra-high molecular weight polyethylene fiber blended with long chain synthetic polymers. Surgeons have used this suture tape successfully for rotator cuff and anterior cruciate ligament (ACL) repairs. The InternalBrace (Arthrex) system also includes BioComposite knotless anchors (Arthrex) for the attachment of suture tape to the talus and fibula. Basra indicates this technique as an alternative to allograft reconstruction in athletic and high-demand patients. The operative technique includes performing a standard Broström procedure with the foot in a dorsiflexed and everted position. Insert two or three metallic bone anchors into the anterior lateral aspect of the fibula. Then utilize nonabsorbable sutures to imbricate the lateral ankle capsule in a pants-over-vest technique and reapproximate the anterior talofibular ligament with the tarsal and fibular flaps. At this time, utilize the FiberTape to reinforce the Broström procedure, which one would orient in line with the anterior talofibular ligament. Using fluoroscopic guidance, place the 3.4 mm drill along the lateral aspect of the talus in a posterior medial orientation. Tap the hole, load a 4.7 mm SwiveLock BioComposite anchor (Arthrex)with the #2 FiberTape and insert this into the talus. Then direct attention approximately 1.5 cm proximal to the distal tip of the fibula and utilize a 2.7 mm drill bit in a slight proximal-superior orientation. Tap the drill hole and insert the limbs of the FiberTape with a 3.5 mm SwivelLock anchor. Basra cautions against over-tightening of the FiberTape as it can lead to postoperative stiffness. The postoperative protocol is a 14-day period of non-weightbearing in a slightly dorsiflexed and everted position, transitioning to a 14-day period of partial weightbearing in a removable cast boot. The author has found that on average, patients are able to begin passive range of motion exercises approximately 14 days postoperatively. It is essential to critically evaluate the native soft tissues and augment the repair if necessary. Regardless of the material utilized for augmentation of the repair, surgeons must take care to maintain proper anatomic positioning and physiologic motion at the ankle and subtalar joint. Exercise caution when performing the repair as overtightening can result in ankle joint stiffness and a less than optimal surgical outcome. Postoperative management should include a comprehensive physical therapy and rehabilitation protocol. Patients who present with chronic ankle instability commonly have associated joint and tendon pathology. A thorough history and physical exam are essential to evaluate for any pathology that one should address during surgical intervention. Our standard evaluation includes stress testing, assessment of the peroneal tendons for any subluxation or entrapment, and preoperative MRI. It is also important to consider each patient’s physical demands and desired functional outcome. We routinely perform an ankle arthroscopy in combination with all lateral ankle stabilization procedures. Komenda and Ferkel found that in 52 ankles with chronic ankle instability, 93 percent of the ankles exhibited intra-articular pathology with the most common finding being synovitis followed by the presence of loose bodies. With arthroscopic evaluation, Lee and colleagues found that 28 patients with chronic lateral ankle instability had intra-articular pathology including synovitis, talar cartilage fibrillation, talar dome cartilage defects, loose bodies, Bassett’s lesion, anterolateral impingement and distal anterior tibial osteophytosis. We have found the use of ankle arthroscopy to be beneficial for the debridement of synovitis, removal of any scar tissue and adhesions, and resection of any associated osteophytes. We also advocate for visual inspection of the peroneal tendons intraoperatively to evaluate for any associated injury. If there is any peroneal damage, we primarily repair it at this time. Although the majority of ankle sprains resolve with conservative therapy, a significant number of patients go on to develop chronic ankle instability. Prolonged disability and recurrent ankle sprains are frustrating for both recreational and elite athletes. Chronic lateral ankle instability is a common and complicated complaint that requires thorough evaluation and surgical planning. It is essential to critically assess for any associated intra-articular and peroneal pathology. Clinicians should ensure a thorough history and physical examination, including stress testing, peroneal evaluation and MRI. One should repair any associated pathology during surgical intervention. Advances in surgical technology and techniques have aided anatomic repair and improved surgical outcomes. Dr. Campbell is a faculty member of the University Foot and Ankle Institute and practices in the Santa Barbara office. 1. Waterman BR, Owens BD, Davey S, et al. The epidemiology of ankle sprains in the United States. J Bone Joint Surg Am. 2010; 92(13):2279-2284. 2. Bell SJ, Mologne TS, Sitler DF, Cox JS. Twenty-six-year results after Broström procedure for chronic lateral ankle instability. Am J Sports Med. 2006; 34(6):975-8. 3. Komenda GA, Ferkel RD. Arthroscopic findings associated with the unstable ankle. Foot Ankle Int. 1999; 20(11):708-13. 4. Cho BK, Kim YM, Kim DS, et al. Outcomes of the modified Brostrom procedure using suture anchors for chronic lateral ankle instability- a prospective, randomized comparison between single and double suture anchor. J Foot Ankle Surg. 2013; 52(1):9-15. 5. Mulhern JL, Protzman NM, Brigido SA. Emerging concepts in anatomic repair of the lateral ankle ligament complex. Podiatry Today. 2014; 27(11)28-34. 6. Sammarco VJ. Complications of lateral ankle ligament reconstruction. Clin Orthop Relat Res. 2001; 391:123-32. 7. DiGiovanni CW, Brodsky A. Current concepts: lateral ankle instability. Foot Ankle Int. 2006; 27(10):854-866. 8. Budny AM, Schuberth JM. Autologous split peroneus longus lateral ankle stabilization. J Foot Ankle Surg. 2012; 51(5):588-592. 9. Basra S. Current insights on augmenting lateral ankle ligament repair in athletes. Podiatry Today. 2014; 27(10):88-92. 10. Lee J, Hamilton G, Ford L. Associated intra-articular ankle pathologies in patients with chronic lateral ankle instability: arthroscopic findings at the time of lateral ankle reconstruction. Foot Ankle Spec. 2011; 4(5):284-9.